Hummingbirds are amazing creatures. 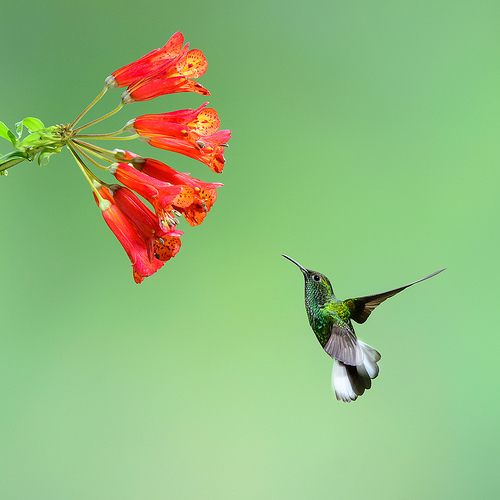 Besides being colorful and often iridescent, hummingbirds are also unique compared to other birds. Depending on the species, a hummingbird's wings move between 12 and 80 times per second (imagine trying to do that with your arms). 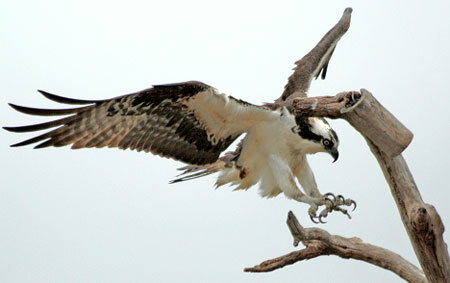 They can fly forwards and backwards and can reach speeds up to 34 miles per hour. The smallest living species of bird is the bee hummingbird, which measures just 2 to 2 1/2 inches long and weighs less than 1/10th of an ounce. 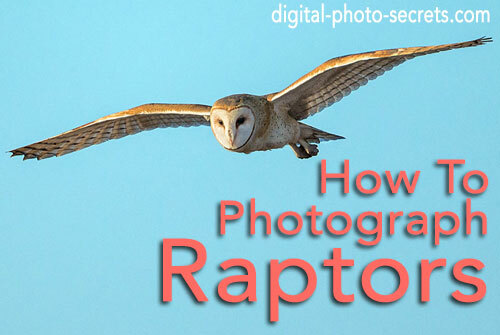 So is it any wonder that photographers are drawn to these birds? Fortunately, with the right equipment and a little bit of knowledge about these tiny subjects, almost anyone can photograph a hummingbird. You might be surprised to hear that the best way to freeze those super-fast wings is not with a super-fast shutter speed. 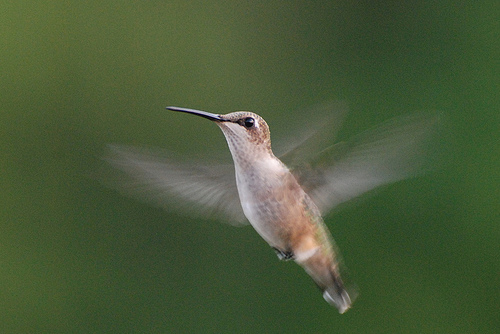 Most cameras, in fact, aren't capable of the shutter speeds you would need to adequately freeze a hummingbird's wings. 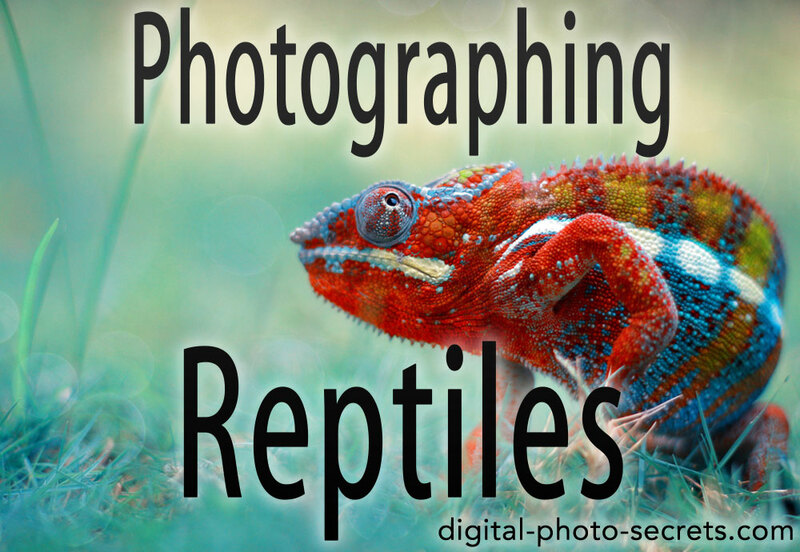 And a fast shutter speed wouldn't be the ideal solution anyway, since you would need to compensate with a wider aperture, which would make it very difficult to keep your tiny subject in focus. Instead you will need to have a high-speed flash on hand - ideally three or four of them. Why? 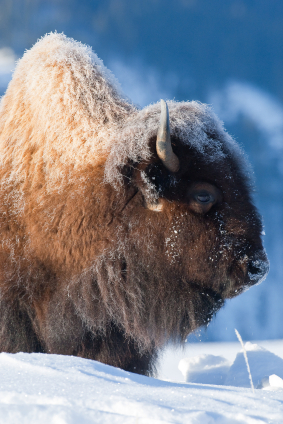 Because you will need a very short flash duration in order to freeze those wings - at least 1/5,000 second. And often shorter than that. At full power, a hotshoe flash has a duration of 1/750 to 1/1,000, and you can only speed that up by reducing your flash's power--which may mean there won't be enough light left to capture your subject. Ideally, you will want to reduce your flash's power to about 1/16th of full strength, which will give you a very short duration but also a lot less light overall. In most cases you will need to compensate by adding additional flashes. Another thing to keep in mind when working with flashes during the daytime is that you'll need to make sure that ambient light doesn't affect your shot. So set up in a shady area, and before your little subject arrives, make sure you meter for your setting and then adjust your camera's settings so that your image would be three or four stops underexposed if you took the photo without your flashes. Of course, when you do this remember that you will have to add flash to every part of the scene that you want in the photo - background included. 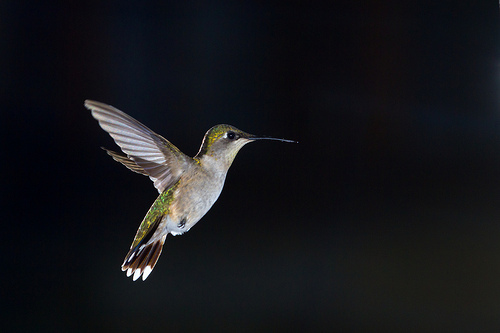 An example of a basic hummingbird flash setup would be two flashes in front of the subject (one on either side), one backlight and one flash to illuminate the background. You will also, of course, need a wireless transmitter, which will trigger those flashes when you depress the shutter button. 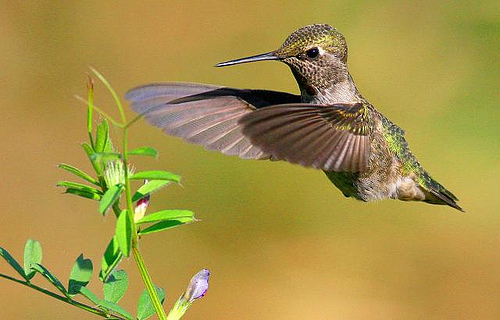 It's hard to get close to a hummingbird, for obvious reasons. 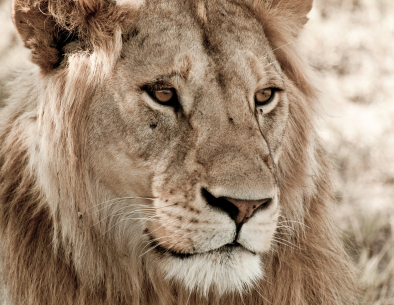 They are small, and you will need a telephoto lens in the 200 to 400 range if you want to fill your frame with one. If you try shooting a hummingbird with a wide aperture, you're going to have a very difficult time getting it into focus. Instead try to get as much depth of field as you can and shoot at f/16 or f/32. Turn off autofocus, because your subject's aforementioned super fast wings will only confuse it. Position your flashes about 1 to 3 feet from where you expect your subject to be. Now determine exposure. You might find it easier to use a camera and flash setup that supports through the lens flash metering, which means you can determine your exposure automatically. For greater accuracy, though, you should learn to use a flash meter. And experimentation, of course, will always benefit you. You can make minor adjustments to your exposure simply by moving the flash units closer to or further away from your subject. 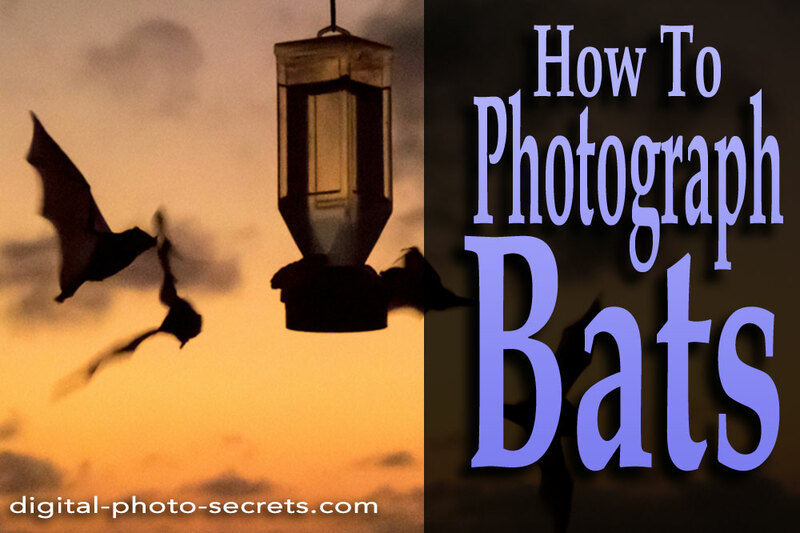 Before you start photographing the birds themselves, try getting a few practice shots. Besides exposure, pay attention to reflections that you don't want (off the feeder, for example), dead or dying flowers and anything else that might detract from the beauty of the final image. Now that you have your flashes set up in various positions and your camera and flash settings where you want them to be, you just need a subject. If you just sit there surrounded by your gear waiting for a hummingbird to happen by, you're going to be waiting a long time - and you're probably not going to have much use for all those carefully set up flashes because you won't have any birds to point them at. 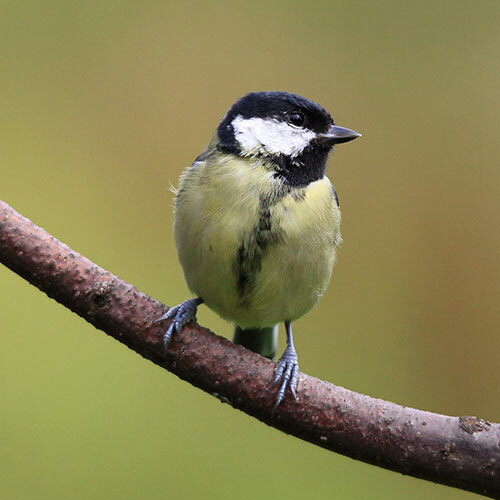 So to ensure that your subject finds you, either set up near trees and shrubs that are known to attract hummingbirds (honeysuckle and mimosa are good examples) or have a sugar water feeder on hand. If you don't like the idea of leaving that cheesy My-Grandma-Had-One-Of-Those feeders in your carefully set-up shot, you can position it in such a way that the camera doesn't see it, or camouflage it with leaves and flowers. Or you can just not bother with one and try to attract your subject by dripping some of that sugar water directly onto one of your subject's favorite flowers. 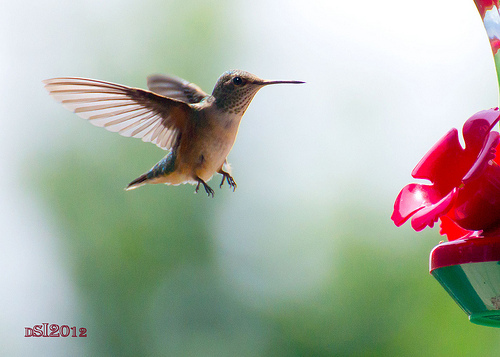 Once the hummingbird arrives, try to limit your movement. You are more likely to scare your bird away by moving suddenly than you are by firing off all those flashes at the poor thing. Do you absolutely have to have all those flashes? No, if you don't mind those blurry wings. 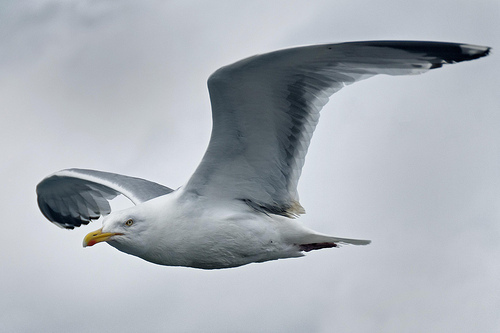 You'll still need to use a fast shutter speed (1/1000 or higher) since the birds themselves move pretty quickly, but you won't be able to get a clear shot of the animal's wings. That may not bother you, though, since the blur can give your viewer a sense of how fast the bird is moving. The shot at the top of this article is a great example of blurry wings. Regardless of how much equipment you use and how complex or simple your setup is, you're bound to find hummingbird photography rewarding - not just because of all those amazing photos but because that little bird's energy and charisma is enough to put anyone in a good mood. Need some inspiration? 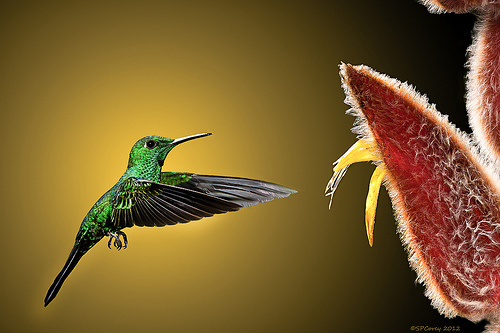 Checkout some outstanding images of hummingbirds from Flickr. I find that if you stay still and don't make fast movements, the hummingbirds will get used to you. They'll still check you out when they fly in, but then go about their business. I usually get part way up on a 6 foot step ladder, bring along a tasty beverage, and patiently wait by a patch of bee balm. I try to stay about 6 feet away from the flowers and shoot with a fast, 105mm prime. This year I also started setting up a 2nd camera with a 10-17mm fisheye zoom below a patch of the flowers and use a wireless remote. You can get a completely different perspective that way. 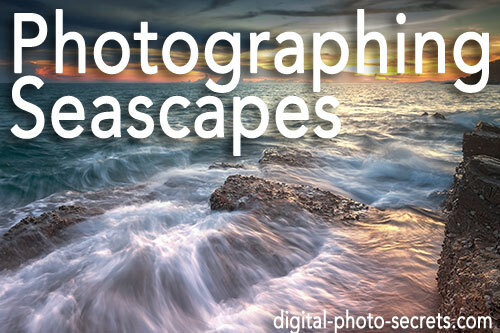 Thanks for your "Photo Secrets". I enjoy it and have turned a lot of other folks on to it, as well. 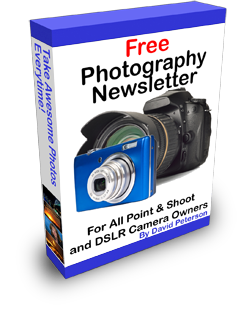 I have been active in photography for many years. I stumbled across this series and have found them to be very informative and helpful. A appreciate that they are free and of such high quality.